MINNEAPOLIS (AP) John DeFilippo stood on top of a double-decker bus with the rest of the Eagles, as they cruised through raucous downtown Philadelphia on Thursday to celebrate the franchise’s first championship in 57 years. Hours later, the Minnesota Vikings handed him the keys to their offense. DeFilippo has had quite the ride in two seasons as quarterbacks coach for the Eagles. 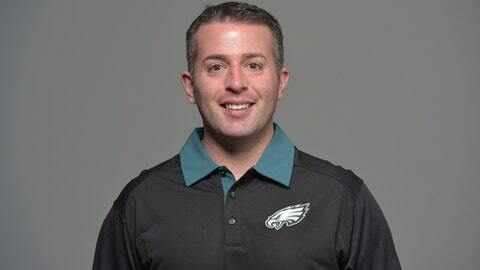 The Vikings finalized their hire of DeFilippo as offensive coordinator on Friday, following Pat Shurmur’s departure to become head coach of the New York Giants. The 39-year-old DeFilippo is the third offensive coordinator Vikings head coach Mike Zimmer has had in five seasons on the job. ”He has a track record of success and has proven to be a great teacher. We feel John will have good chemistry with our team, and we are all eager to get to work,” Zimmer said in a statement. Just five days earlier, the Eagles beat New England 41-33 in the Super Bowl in Minnesota behind an MVP performance by Nick Foles . With guidance from DeFilippo, offensive coordinator Frank Reich and head coach Doug Pederson, Foles found a rhythm in the playoffs after an initially rocky takeover for the injured Carson Wentz. In those three games, including a 38-7 victory over the Vikings in the NFC championship game, Foles threw for 971 yards, six touchdowns and only one interception for a 115.7 passer rating. Against the Patriots, Foles threw for 373 yards and three touchdowns and even caught a pass for a score on a trick play. He’ll apply that same approach to the Vikings. Now he’ll work with Zimmer and general manager Rick Spielman to sort out the quarterback situation, with contracts for Case Keenum, Sam Bradford and Teddy Bridgewater all currently scheduled to expire next month. Character, decision-making, timing, accuracy and leadership were the attributes DeFilippo emphasized, in that order, when describing his priorities for the sport’s most critical position. When asked about the importance of athleticism, DeFilippo tacked that trait on to the list, too. ”I’m not a big believer in quarterbacks that are a stick in the mud back there, they’re in cement back there, at 7 yards deep,” he said. Wentz was an NFL MVP award contender with 33 touchdown passes in 13 games in his second season in the league in 2017, until tearing the ACL in his left knee. With DeFilippo as the offensive coordinator for Cleveland in 2015, the Browns gained more than 4,000 passing yards and 1,500 rushing yards in the same season for the first time since 1986. DeFilippo also has five years as quarterbacks coach for Oakland on his resume over two different stints, including in 2014 when Raiders quarterback Derek Carr threw only 12 interceptions, the fewest by a first-year player in NFL history with at least 450 passing attempts. DeFilippo, who was a four-year letter-winner as a quarterback for James Madison, has taken his 11th job in what will be a 19th season of coaching. Vikings quarterbacks coach Kevin Stefanski, who interviewed with Zimmer for the promotion, becomes a strong candidate to join Shurmur with the Giants as the offensive coordinator there. Former Seattle Seahawks and Vikings offensive coordinator Darrell Bevell was also considered along with Houston Texans quarterbacks coach Sean Ryan and New Orleans Saints tight ends coach Dan Campbell, according to various reports. DeFilippo rose to the top of the list, though, having also been considered by the Chicago Bears and Indianapolis Colts for their head coach vacancies.